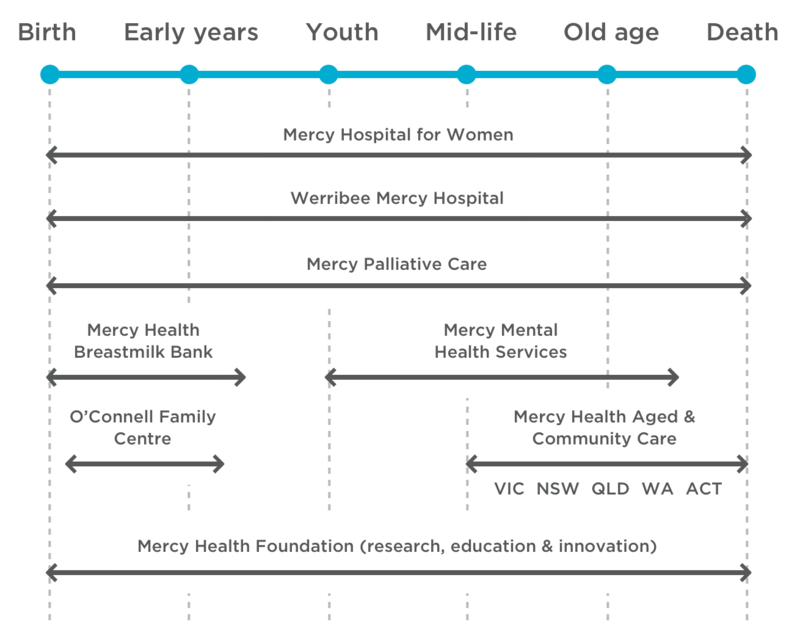 ​Mercy Health delivers compassionate health, aged care and community services to people at every stage of life from before birth to death. The following diagram describes the services Mercy Health provides at each stage of a person's life. Mercy Health delivers a continuum of services that span the various stages of life from birth to death and every stage in-between. 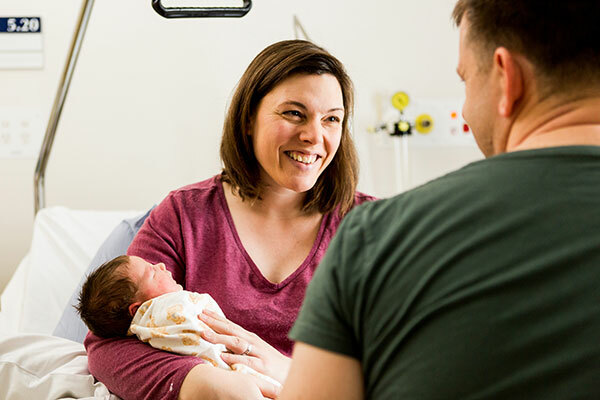 At the start of life, Mercy Health cares for mothers and babies from conception, through pregnancy and birth at Mercy Hospital for Women in Heidelberg and Werribee Mercy Hospital. At Heidelberg, mothers and babies can also use Mercy Health Breastmilk Bank. This is Victoria’s first breastmilk bank, which shares safely collected and screened breastmilk to ensure newborns get the benefits of breastmilk even when their own mother cannot breastfeed. Mercy Health O’Connell Family Centre is focused on the needs of vulnerable families and young children. The residential, day and community programs provide child-focused parenting skills to promote safe child development. Mercy Mental Health Services supports people in southwest metropolitan Melbourne with severe and complex mental illnesses by providing acute and community-based care. 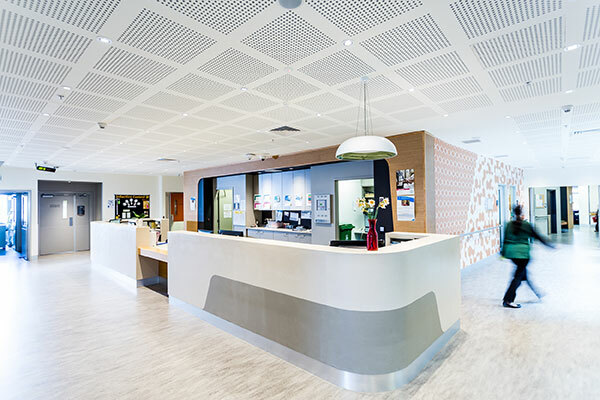 In Western metropolitan Melbourne, Mercy Palliative Care accompanies people of all ages who are diagnosed with incurable or terminal illness through inpatient and community-based palliative and end-of-life care. We also provide bereavement support through Mercy Grief Services. 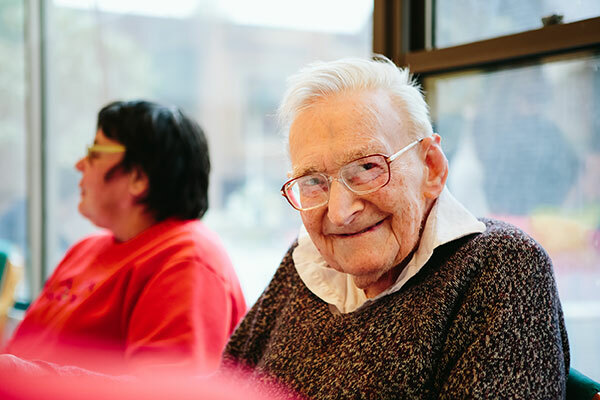 Mercy Health also supports older Australians to live well as they age, through home and community care services, residential aged care and retirement living. Our services include health and mental health services in Victoria and New South Wales and aged and community care services in Western Australia, Queensland, Victoria, New South Wales and the Australian Capital Territory. Mercy Health Foundation raises funds to support the delivery of our services and to provide opportunities for the community to join with us in delivering compassionate health and aged care for all people at all stages of life. Last reviewed February 7, 2019.